“Drivers are very nice, polite and helpful. 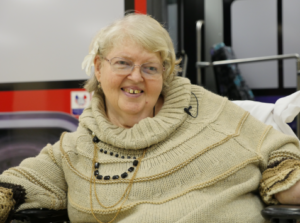 ACCESS is a coordinated, shared-ride paratransit service, which has been providing door-to-door, advanced reservation transportation in Allegheny County since 1979. This unique public-private partnership leverages eleven separate federal and state funding sources to create an affordable mobility option for riders. ACCESS service is provided by six service providers operating from seven locations with 300 vehicles, operates with an on-time performance of 96.4%, has a vehicle productivity of 2.24 trips per hour, maintains streamlined efficiency with administrative cost of 5.5% of total costs and provides ADA complementary paratransit service that not only meets but exceeds all ADA minimum requirements. ACCESS is among the largest coordinated systems in the country with an average of 5,000 trips on weekdays, 1.5 million annually. ACCESS’ award-winning coordination earned the United We Ride National Leadership Award. The Federal Interagency Coordinating Council presented the award, which recognizes the work ACCESS and Port Authority have done to create a highly effective coordinated service which stands as a model for the rest of the nation. In addition to basic paratransit service, ACCESS offers a person-centered solution to individual transportation needs. ACCESS provides its customers and 140+ sponsoring agencies a menu of amenities that make the service more user-friendly. Amenities include driver assistance up/down as many as four (4) steps, assistance with up to four (4) packages, hand-to-hand service for individuals who require constant supervision, assistance with car/booster seats, service modifications, a web-based, cashless payment system (ePurse) and “In Touch” automated call-outs or text messages for 10-minute arrival/pick-up notification, ePurse low balance warnings, and weather service updates. ACCESS also maintains a “No Strand” policy to guarantee a ride home every time. ACCESS is open to the general public but primarily serves people with disabilities, clients of human service agencies and people aged 65 and over. ACCESS is sponsored by Port Authority of Allegheny County.